Johannesburg, April 2015: The recent addition of VidiGo to Primedia’s operations has changed the way the company, which is primarily concerned with radio, thinks about the creation of video content. According to Chief Operations Officer Ryan Till, much of what they do with VidiGo would not have been possible four or five years ago. Johannesburg, August 2014: Questek Advanced Technologies has recently installed a new video conferecing communications solution in the South Gauteng High Court that sees greater efficiencies in judicial proceedings, cost savings and drastically improves security. Johannesburg, June 2014: Traditional conference systems used to be audio-only, designed to optimise intelligibility for all delegates in the room and to facilitate meetings that follow on certain protocol. 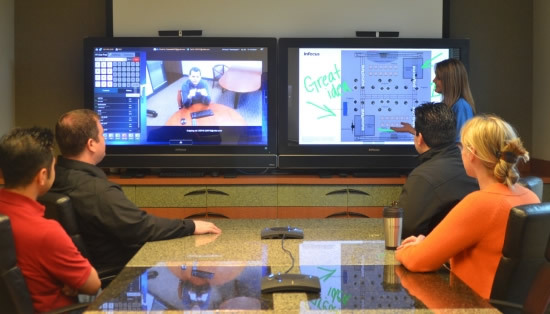 Nowadays, conference rooms are becoming collaborative meeting environments, fuelling the need for multimedia conference systems. Johannesburg, June 2014: Barco, a leader in professional meeting room visualization and collaboration systems, introduces the new CSM Base Unit for its ClickShare collaboration and presentation system. ClickShare now comes in two flavors – the new CSM Base Unit and the original full-featured CSC Base Unit – so that any meeting room can benefit from the ClickShare experience. Johannesburg, April 2013: Questek Advanced Technologies recently completed the configuration and integration of the 2 650sqm LED display that clads the top of the 29-storey ABSA Towers in downtown Johannesburg. Featuring 20 million LEDS, this iconic branding and marketing tool is being billed by the supplier and manufacturer, Barco, as the world’s biggest commercial visual display system. Johannesburg, June 2012: Questek recently introduced InFocus’s t first all-in-one giant tablet for business-class video conferencing and collaboration – the Mondopad to the South African market. Measuring 55 inches (140cm), the HD wall tablet combines intuitive touch collaboration applications with any-to-any, cloud-based video conferencing to offer a disruptively priced all-in-one collaboration display.